Given the heated discourse on race relations today – on and off stage – I am not sure if my title’s statement is positive or negative. One thing is for sure: we can never escape our history. This is the position which Sybil (Virgilia Griffith) maintains and will fight to the death to honour in Djanet Sears’ Harlem Duet, onstage now at Tarragon Theatre. It creates great tension throughout the play as her partner Othello (Beau Dixon) wishes to move beyond his “blackness” and no longer let it “define” him. Both their performances are incredibly impressive and dynamic, especially since the play moves between three eras, non-linearly. They stunningly capture the nuances of the nineteenth, twentieth, and twenty-first century with great ease, mastering their voice and bodies. Sybil is like a Samantha White ahead of her time. In Netflix’s Dear White People, students at an Ivy League school deal with relationship drama, identity crises, and racial tensions. In Sears’ play, Sybil – despite being pained – is a strong, intelligent woman who happens to be a grad student studying the psychology of black people. Her academic dialogue arrives at a juncture with reasoning on why her partner has left her to be with a white woman. On TV, White struggles to come to terms with being a black student leader amongst criticism from her peers, when she starts to date a white guy. Further, season one is almost entirely centred on the students’ reaction to a blackface party. In Sears’ play, our male protagonist appears in a dream sequence in 1928 Harlem as an actor applying blackface. Controversially, blackface has been used, even within the last decade, by white actors playing black roles like Othello. In other dream sequences, the couple is seen pre-emancipation conversing on a plantation; slaves in love wanting to escape it all. Assisting them in transitioning between eras are the cotton plants that emerge from a trench which seems to bleed from the modern apartment, and minimal yet striking furniture and costume choices by designer Astrid Jansen. 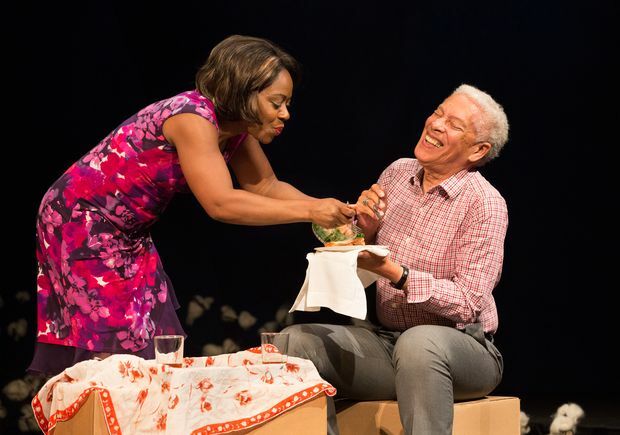 Providing comical relief to otherwise serious text is the memorable landlord Magi (Ordena Stephens-Thompson) who is as nurturing in her care as she is distracted to find a husband. The sensational Walter Borden (our 2017 Critics’ Pick Award winner for Outstanding Actor) appears as Sybil’s father in the second half of the show. He commands our attention and his charm makes it easy for us to forgive him for being absent so long. Notably, this Freudian trope of the father figure as it links to a disturbed child is more characteristic of psychoanalytical literary theory being deliberated around the time of the play’s conception. What likely comes off as less nuanced for an audience today is the question of mental health. While dealing with the separation from Othello, Sybil spends enormous amounts of time in bed and is slowly deemed us unsound. This escalates towards intervention. Today, fortunately, we might recognize the signs and symptoms of depression earlier on. If her character was written today, critics might contest using her mental health as a trope to demonstrate her downfall and there would be outcry for the depiction of a person of colour as an anti-hero who must collapse. Indeed it is still rare to see people of colour in leading roles portraying empowered characters. While Sears aimed to give voice to a black male who had mostly been voiced by white males throughout history, today her piece seems to resonate even louder for black women gaining their voice. In this way, this Canadian classic lives up to its reputation, continuing to foster much needed conversations. Theatre Smash’s Ugly One is Rather Pretty.